A growing number of people now use two mobile phones. Nokia Car Kit CK-200 is one of the first to incorporate a multipoint connection, allowing two handsets to be connected at the same time. With one click of the wireless remote control, drivers can access both their handsets to handle work and personal calls. All with excellent audio quality thanks to DSP and an embedded 9mm microphone. 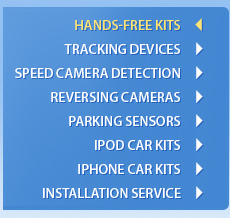 Nokia Car Kit CK-200 is compatible with handsets from all manufacturers. The simple and elegant 2.5” display makes searching through your contacts easy.